What schematic did U use and what cable has been yours built of? Maybe it's up to the TV set, maybe it's very old (just guessing). Does the TV set give better colors in case of signal from other RGB source? Resistors on the RGB lines would only make the colours less bright. Sounds like an issue with your TV being a bit old and tired, so check it with another input source. A rather less likely possibility is that your video card RGB outputs are relatively low. In that case you could try a video amplifier (ultimate sells them at a reasonable price), but a fair bit of hassle involved with hooking it up. Better to test with another TV first. Must be the videocard then because I've tested my CRT with another RGB source and it worked. Bummer! Thx for the answer guys! well, PC VGA ports typically only output 1V of signal, some monitors like 5V and don't amplify it themselves. I don't know what voltage SCART expects, but given that it's not a protocol or signalling standard, it seems that it would depend on the TV you're hooking up to. Amp it up to 5V and I think you'll have an amazing picture. You mean amping the pins red, blue and green? Rigby, while what you say about arcade monitors requiring higher voltage on RGB is true, the RGB TTL standard for TVs is only 1v. Should be no need to amplify the signal from a video card to a TV. I've done VGA/SCART to literally dozens of TVs and never seen an exception to this. If one does need a video amp, Ultimarc sell the at reasonable prices. But it is likely not necessary. Better to check with another TV and another video input source first. You could use a multimeter to check the voltage on the RGB signals but this is tricky as is must be done while the system is operating and requires access to exposed RGB signal wires while everything is turned on, in-circuit and working. I did this before with a JPAC from Ultimarc (which has an on-board video amp) hooked up to a TV and was surprised to find only 2-3v on RGB. In this case I has the opposite problem - the voltage was too high for the TTL TV standard 1v and the picture was "blooming" as the colours were too bright. So I suggest testing the RGB voltage levels while everything is in circuit and turned on. Be aware that the RGB voltages will vary depending upon what is happening with the video signal, but should peak at around 1v. Ok! No problem, I can check that with a multimeter. In my case, I should have a low voltage value, right? Under 1V maybe? That's may be the reason why my colors are weak. If the RGB signals ends up being at 1V I don't know what to do next. FYI: I have a 12V source connected to the SCART plug to make my CRT TV select the SCART input when turned on. Is this something I could use for amping the RGB signals if they're low? I also don't have any resistors och anything in my SCART plug. Only wires connected to pins. Good or bad? Is there any resistors you really should have that I've missed? Bit of a curiosity: I know there were some RCA Dimensia sets that had an "EIA MULTIPORT" socket, and earlier revisions only supported TTL signals. What about the port on later models that also had an s-video socket? I am curious about what type of RGB (if at all) was supported by the later CTC140 chassis. Figured out I can buy SCART CRT TV's her in Tanzania for around $40 US for a 19 inch, with out haggling. As an American this is a rare opportunity. As a plus, we get a shipment back to the US when we move home as part of my wife benefits. I'm tempted to pick up a larger TV as well as it is unlikely I'll have the opportunity to buy a SCART TV once I'm back in the states. Now my questions is what should I be aware of when buying one? Now my questions is what should I be aware of when buying one? Nothing in particular. As long as the TV supports RGB input via SCART (I have seen some that only accept S-Video via SCART) and also NTSC and PAL (I have only seen one PAL only SCART TV out of the 100+ I have come across in my travels) so you've got the 50 to 60 Hz range covered. I guess the other consideration is whether you want picture adjustments via a Service Menu or internal trimpots. Both have their pros and cons. Yea SCART is not an official standard here but so many TV have be brought over by expats and I would imagine that the worlds back stock of crt TV's got shipped here. I don't think there is much hope of finding the original remote. How about a universal replacement remote? Believe it or not, you can still buy new CRT TV's here. They don't have SCART and they don't always have the best pic or cooler but there are apparently still manufacturers. I went and looked at a few TV's today. Some of the 14 inch ones were in really good shape. All the 21 inch ones with SCART at this shop were all flat glass and did not have the best images. I took down the info on one seem to have a particularly good image a Philips 14pt6107/05d. I found the manual but it does not say any thing about the service menu or wether or not it supports RGB over SCART. I can get to the ￼Picture settings with out a remote. What should I do? Is there a web site that will tell me how to get in to the service menu? Edit:Found this I'll test it tomarrow. Also they have replacement remote that are specific to each brand. I'm thinking of making a VGA to SCART cable and just testing each TV. It seems that most of the Philips CRT's here have SCART. I'm a little confused. Is the return for each color the shielding around that color? I tried to test with my multimeter but all shielding goes to ground so its not posable to confirm with a multimeter. Also in my VGA cable Red signal is a red wire, Blue signal is a blue wire, Green signal is white, and one sync is green the other is white. That was needlessly. confusion. Does anybody know what I've done wrong here? This is a Jamma PCB going to the RGB scart input on my TV. The board output is fine when going into a scaler/line-doubler thing I've got. The TV is fine when plugging in any RGB game consoles. I get the same effect on another spare CRT too. It's not really a black and white image, it's almost totally black with only the outlines of sprites etc visible, these pics were taken with brightness wacked up full. The Jamma harness has a plug with R,G,B,GND,SYNC wires. Those are going to the appropriate pins on the scart plug, as shown in the OP. The only difference is I'm using one GND wire daisy chained to all the returns, instead of lots of seperate grounds... is this what's causing the problem? All the grounds are joined together on the board anyway so I don't see how it would make a difference. I've added +5V to the blanking pin 16, this made no difference good or bad. I added a 100 Ohm resistor to this wire, still no change. I added 150 Ohm resistors to the RGB wires, obviously this doesn't help either. I haven't sent any voltage to pin 8 since I can just use the remote control to switch to the scart channel for now. It's now working on my tiny spare CRT. I removed the resistors from the RGB wires, and removed the resistor from the blanking pin wire and just bridged it to the sync pin (as Zebidee suggests on page 1) instead of using the +5V from my PSU. Aside from some overscan on the right, the picture is absolutely perfect, even without those resistors the RGB isn't too bright. 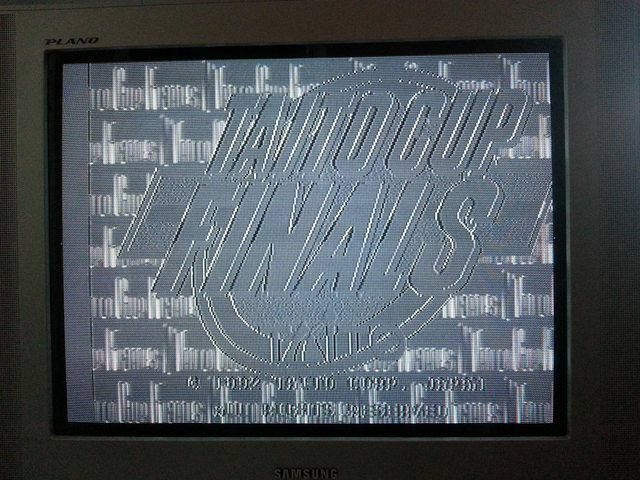 Problem is, my main CRT is still showing exactly the same mostly-black screen as in the previous post. No difference. Any ideas? I suggest you try combining all your ground wires together ("daisy chain") and hook them up to pin 18. Although I guess that is what you had before. We don't know if all those grounds (5,9,13 for RGB) are actually connected on that TV. Most commercial SCART cables I've pulled apart just combine the grounds. Ground on pin 18 should be good. Keep in mind that you may need different SCART cables to accommodate different TVs, as not all SCART TVs are the same. For example, some TV's work better with (PSU +5v + resistor) to pin 16. Some work better if you just bridge 16 to 20. So I made both kinds of cables. You might be better off keeping your cable that works for your "spare" TV and making a new one for your "main" TV. Regarding your RGB brightness and JAMMA: if you are connecting jamma boards, diffrerent PCBs may have quite different RGB output levels. 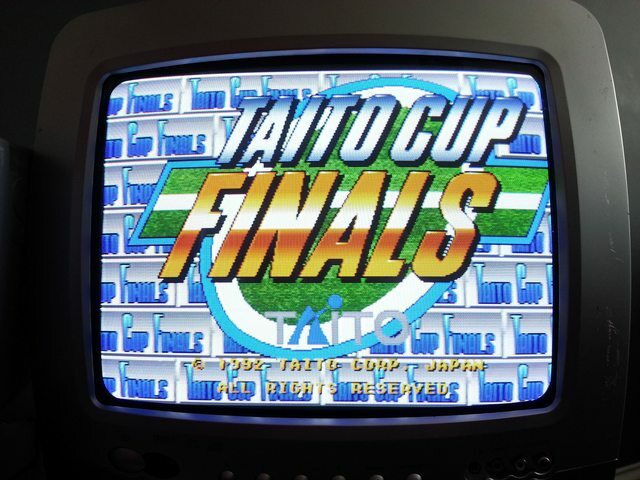 So the nice picture you get with "Taito Cup Finals" might be different (e.g. colour too bright) with another JAMMA PCB! In such a situation resistors on RGB might help. Something to keep in mind as you try other boards. Thanks for the reply Zeb. I know this thread is old but I'm interested in doing this. I have a CRT and 2 other TV's here I have with SCART connectors. I have a spare VGA cable and a SCART lead. Can I just make it like page one or do I need resistors? The only resistors I have here at the minute are 33ohm.